If you like deviled eggs, you’re going to love this deviled egg spread recipe! Bring it to a party, and watch it disappear! I’ve made this deviled egg spread three times in the last month. 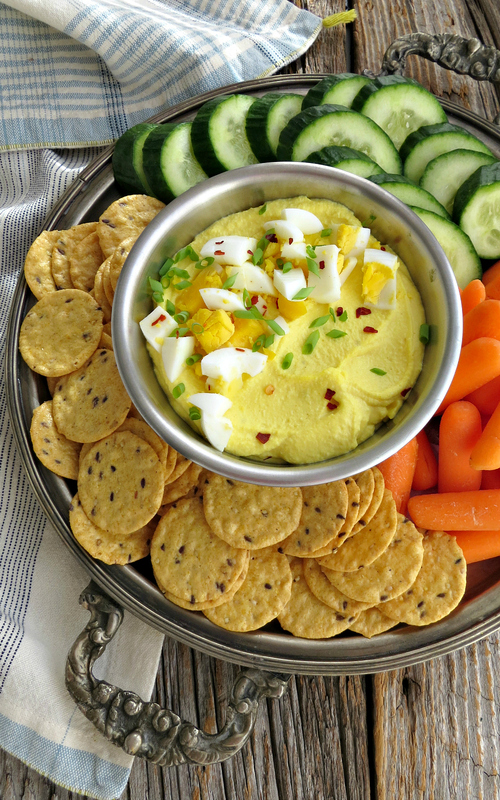 It has all the flavor of deviled eggs in a smooth, creamy, addictive spread that you can also use as a dip. And my favorite part is that you can have it done in about 15 minutes! There are so many things I love about this recipe. It’s easier than deviled eggs. Just throw it all in a small food processor, give it a whirl, and you’re done. It goes further. This was just six eggs, and it was enough for 12 women. It’s low carb, keto, and naturally gluten-free. You can serve it the way I did here as a dip or use it as a spread on sandwiches, wraps, crostini, or finger sandwiches. It’s a crowd pleaser! Seriously. Bring this to a party, watch it disappear. Everyone loves it! Deviled egg spread is easy, versatile, and delicious! This is the exact plate I brought to a Galentine‘s day party that my dear friend Angela from Spinach Tiger threw this past weekend. When I’m cooking for a crowd, I try to take into consideration that many people are eating gluten-free and low-carb these days, including myself. This is perfect. The dip itself is full of protein, nutritious, and has very little carbs. I serve it with a variety of vegetables and some gluten-free rice crackers, so there’s something for everyone! To make it, use the same ingredients that you would normally use in your favorite deviled egg recipe. For me, that’s just eggs, avocado mayo, Dijon mustard, lemon juice, salt, and pepper. You could add your favorite herbs, a little spice, whatever floats your boat. I was out of black pepper, so I added a little crushed red pepper today, and we really liked it. Deviled eggs need a little acid to cut through the rich egg filling. I prefer lemon juice to brighten it up a bit, but you could use white vinegar or red wine vinegar instead. Start with less and add more to taste. To hard boil your eggs, you can do it the old-fashioned way or use this handy egg cooker, which gets near perfect reviews and is super quick and easy. It’s perfect for college students living in dorms! This recipe is written just for the dip and not the garnish, which is really up to you. I like to boil an extra egg and add it to the top along with some finely chopped chives and a few crushed red pepper flakes. A sprinkling of paprika and some chopped parsley are nice too. 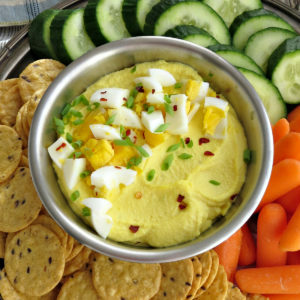 If you like deviled eggs, you’re going to love this deviled egg spread recipe! Add the eggs, mayonnaise, Dijon, and lemon to a small food processor and blend until smooth, scraping down the sides as needed. This recipe is easily doubled to feed a larger crowd!